Crimson Pygmy Barberry, Berberis thunbergii 'Crimson Pygmy', is a naturally compact plant with deep ruby-red foliage. Small yellow flowers in spring produce bright red fruit and later combine with fall colors of orange-scarlet to create an excellent addition to the landscape. It does well in sun to light shade and tolerates a range of soil types, except wet. Berberis thunbergii 'Crimson Pygmy' keeps its ruby-red foliage all season and the new growth is bright red in color, but this plant does best in full sun to produce its color. It produces bright, red berries from fall through winter. 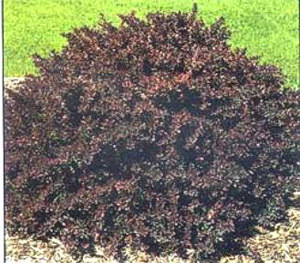 The Crimson Pygmy Barberry is a miniature Barberry and only grows to be about 2 feet tall and 3 feet in its spread. Its habit is broad rounded, uniform, and dense.